Trinidad 7 Pot Primo (Capsicum chinese)-This 7 Pot variety comes from a man with the web nickname of Primo. His real name Troy Primeaux. He is an accomplished musician and Horticulturist from Louisiana, U.S.. 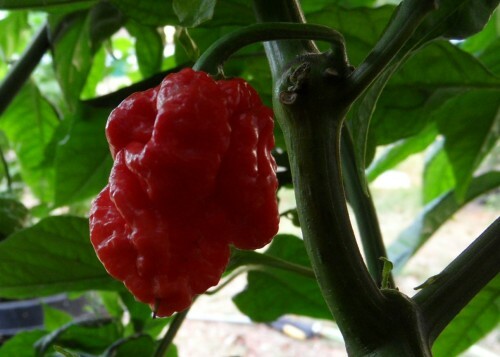 The 7 Pot primo has very lumpy distorted shapes and sometimes will have very long skinny Scorpion like tails. It is extremely hot and has a nice fruity flavor. He created this variety about six years ago (as of 2012) crossing a Naga Morich and a Trinidad 7 Pot. The 7 Pot Primo chile plants grow up to 4 feet tall.